Wondering where our Christmas card is? If you typically receive a Christmas card from us, don't worry, we haven't decided we don't like you! I'm just a little behind, but I promise they're in the works and will get to you in the next week. In the meantime, know that we all wish you a very Merry Christmas!! As I'm always on the hunt for new ways to bribe Emmylou into behaving, it's nice that with the joyous Christmas season comes the return of Birdie, our Elf on the Shelf. If you don't know, Birdie works for Santa and is specifically assigned to watch Emmylou and Miller each day. 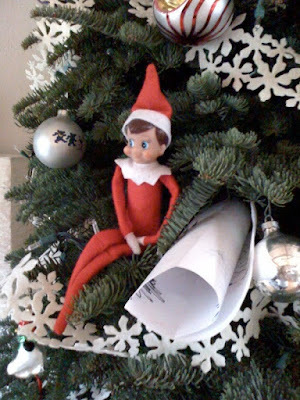 He reports on their naughty-or-nice-ness each night when he flies back to the North Pole and then returns to hide in a new spot in our house each morning. Emmylou absolutely loves looking for him when she wakes up (he's the first thing she asks about) and it's pretty easy to get her to do/stop doing something if I threaten to tell Birdie about it. He even takes cell phone calls from HEB, if you can believe it. The other day she decided to draw Birdie a picture, which sounds really sweet but I think it was really an attempt to make up for some earlier misbehaving. Birdie happened to be watching her and Miller from the Christmas tree that day and when I came into the room later I saw that she had rolled up her picture and put it right next to him so he could take it back with him to the North Pole that night. 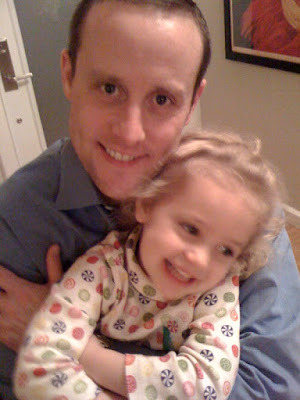 Anyway... here's a photo (of awful quality) of G and E on his last day after 11 years at Dell!